When it comes to enjoying your recreational vehicle, small trolling boat, or any number of other applications, a dead battery can ruin your day. Deep cycle batteries are a must for anyone who uses these modes of transportation as well as items like solar panels, lawn and garden tools, or medical mobility devices. Finding a deep cycle battery that is both reliable and affordable can be a challenge. Use the following information to help narrow down your options before deciding on the perfect one for all of your power supply needs. The Optima Batteries Blue Top Starting and Deep Cycle Marine Battery is created as a dual purpose model. It is both a deep cycle and a starting battery in one design for those that need a strong cranking, sure starting, and maintenance free source of power for their RV or boat. It even works in harsh conditions. The Spiral Cell unique design offers a clean and strong power source that ensures the safety of you and your family as well as the environment. A longer shelf life is provided by this battery’s high reserve capacity that can also give you the power you need, when and where you need it most. This particular battery was created with boats and recreational vehicles that have larger accessory loads in mind. Installing this blue top AGM Battery from Optima into your RV or boat means that you will have exceptional running time as well as more recharges than a traditional battery will offer. It is ideal for boats with extensive electronics and trolling motors, and it works perfectly as an RV battery in recreational vehicles with added comforts that often drain the battery quickly. This battery has wonderful vibration resistance, and it efficiently delivers power along with a faster recharge time than with similar deep cycle batteries. You can spend your time having fun rather than worrying about the battery. With this battery you will be getting as much as three times more recharges than you will with other marine batteries. It also has 15 times the resistance than other designs when it comes to vibrations. It is spill proof, and it can be mounted in any position. It weighs 43.5 pounds, and it measures 10 by 6.9 by 7.8 inches. It comes with a parts warranty that warrants you that it is free from defects in its workmanship and materials for a two year replacement period. This Optima battery comes with Spiral Cell Technology. This is a series of spiral wound cells that include two pure, 99.9% lead plates that are covered in a lead oxide coating. One of these specially coated plates is positive while the other one is negative. This process is much more precise than the process used to create traditional flat plate AGM type batteries. Quality and performance are maintained through the close tolerances created by the automated cell winding machines. The temperature, critical tolerances, automated processes, and humidity are all constantly monitored during construction. 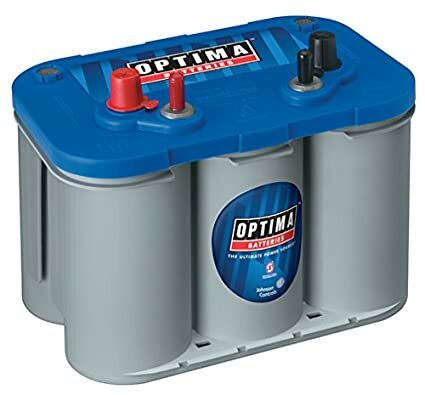 The Optima Blue Top battery with its dark grey body and blue top is best used when you need a dedicated starting battery. It should not be used for cycling duty. It is best used in RVs and boats when engine starting is the only function required of the battery. This battery can be used as both a deep cycle and a starting battery, although it truly is a deep cycle battery with incredible high cranking power. Its many uses include marine applications, trolling motors, and heavy electrical accessories. This is a six cell lead acid battery with 120 minutes of cranking power. It could be used as a secondary battery for car audio, but if your system draws a high number of amps when it is at a high volume, you may be better off with the yellow top Optima. Online reviews state that this battery will truly hold up. Those that use it with a trolling motor when fishing were amazed at how much battery charge they had left at the end of the day. Many people like that it can be mounted at any position due to the fact that it is sealed. They do not have to worry about venting gas like you would normally get from a flooded battery. It holds at 12 volts for an extended length of time, even when under a load. It also charges faster than other batteries, and it doesn’t heat up when charged quickly. The VMAX AGM Deep Cycle 12v 125ah SLA Rechargeable Battery is ideal for use with Smart Chargers, Wind Turbine and Inverters, and Pv Solar Panels. This heavy duty battery is classified as a Group 31 with custom plates that are military grade. It has an eight to ten year float service life span. Best of all, you will have no worries about dangerous gases or fumes with this battery that is constructed for 99% recombination capabilities. This particular deep cycle battery is manufactured under the brand name VMAX Solar. They specialize in high quality products, and their batteries provide you with superior performance. This particular version will measure 6.8 by 12.9 by 8.7 inches, and it weighs 75 pounds. They are actually manufactured in China, but they are sold by a United States’ company located in Southfield, MI. The VMAX AGM 12v 55ah Battery can be mounted in any position without the fear of affecting the power output. It is completely sealed, and it does not contain any of the free roaming fluids that you would typically find in a lead acid battery. They also have minimal venting. This means that you can use it inside, but when it does get used in an enclosed area, provide at least some form of venting to reduce the risk of hydrogen gas build up. Each VMAX battery is manufactured to precise military specifications so that they will hold up quite nicely against the elements. Many people wonder if this battery needs to be kept on a trickle charger over winter or any other time when they won’t be using it regularly. If the battery is fully charged and has not suffered any abuse, this is not mandatory, but using a trickle charger to keep it above 80% will prolong its life. Use a smart charger that has been rated for use with an AGM battery and has an automatic shut-off. Over charging can be just as harmful as allowing it to drain completely. Smart solar panel chargers work nicely with this particular battery, even in situations where there is limited light or cloudy, overcast days. 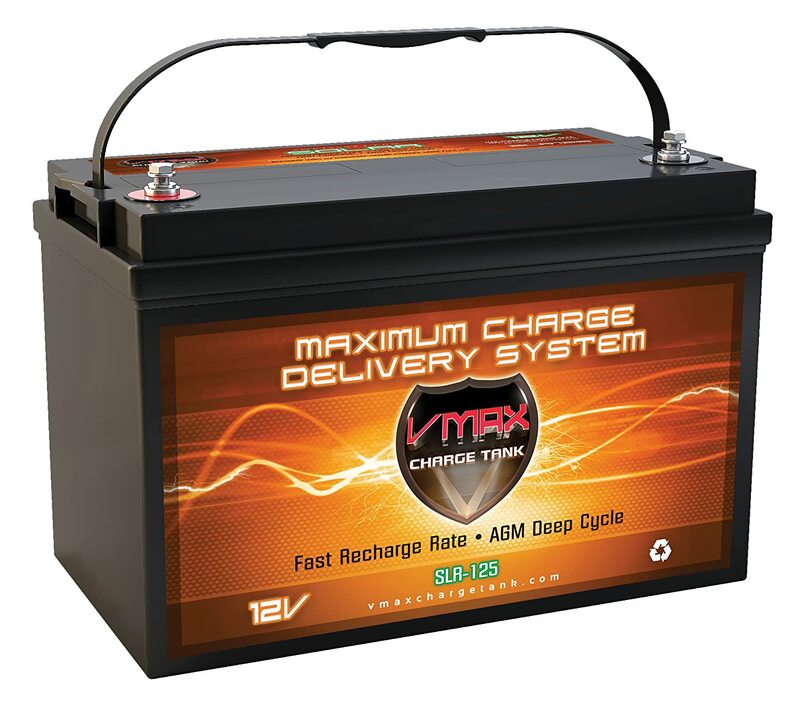 The VMAX AGM Deep Cycle Rechargeable battery receives very few negative comments in the online customer reviews. They come highly rated, and people love the low price point. Many have found that they can easily afford one more battery than they calculate necessary due to its affordability. This can be added security when using it with solar panels. Those that had already purchased this deep cycle battery say that it comes fully charged and ready to use. It does not come with the connecting cables. These will have to be purchased separately. The built in nylon handle is a nice extra feature, and the battery itself is over-all a sturdy and clean piece. The torqued terminal bolts are also a nice surprise as opposed to the terminal posts found on similar batteries. In addition, they have a lifespan of eight to ten years while others are lucky to reach half of that. The Mighty Max 12v 55ah Power Deep Cycle Battery delivers the power you need when you need it. It is designed with a state of the art, calcium alloy, heavy duty grid that gives you exceptional service and performance in both cycle and float applications. The ML55-12 has Absorbent Glass Mat technology along with a valve regulated construction. It can be safely used in indoor and enclosed environments without the fear of maintenance or leaking. It provides exceptional performance for thousands of uses. This particular battery can be utilized in many different applications such as electric vehicles, consumer electronics, golf carts, engine starters, lawn and garden tools, hunting, motorcycles, medical mobility, portable tools, power sports, toys, hobbies, solar, emergency lighting, access control devices, and security. This battery weighs 38.58 pounds, and it will measure 9.02 by 5.43 by 9.13 inches. It comes with a manufacturer’s one year warranty. 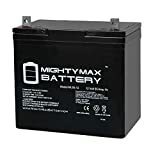 The Mighty Max Deep Cycle Battery is a spill proof, sealed lead acid battery that comes with wide operating temperatures, a high discharge rate, deep discharge recovery, and a long life span. Mounting accessories and wire harnesses are not included in the purchase price, but you will receive all of the necessary nuts, bolts, and washers. It also includes a fold up handle that makes it easy to transport. This particular battery can be mounted in any position, and it resists vibrations and shocks. It will provide you with long lasting, high performance whether it is used in high or low temperatures. 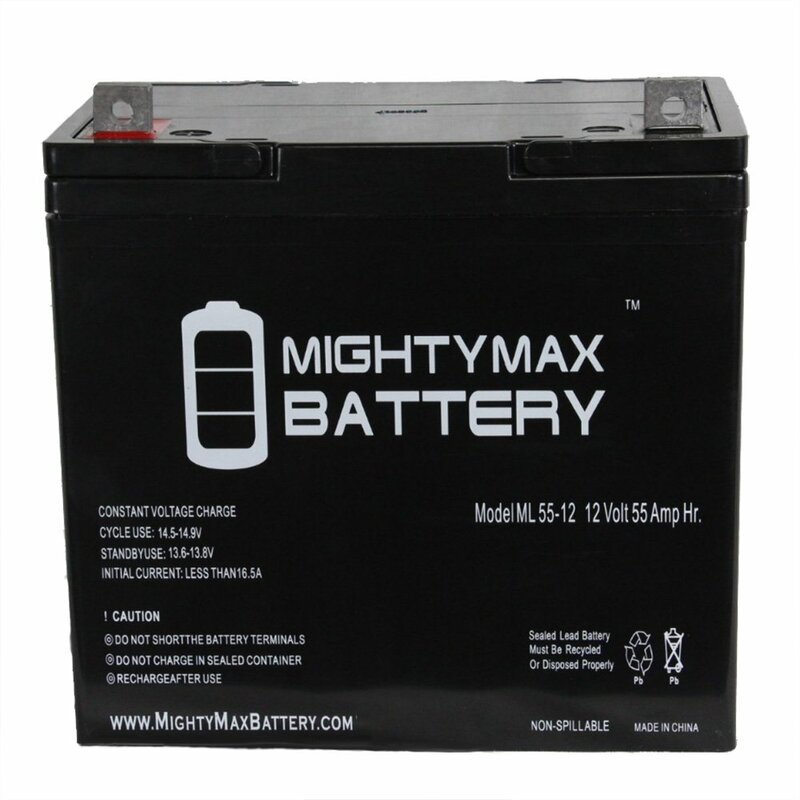 When you get your Mighty Max Deep Cycle Battery it will be fully charged and ready to use right out of the box. When it does come time to recharge it, any 12v charger will due. It is classified as a Group 22 battery with a 55 ampere per hour rating. It comes highly recommended in the online reviews. Many people said that they could get about four hours of full speed use as well as six hours of medium speed and still have roughly 60% battery charge left at the end of the day when it is used for a trolling motor. This Mighty max deep cycle battery also works nicely with off grid solar projects. It can easily handle a few of the small lighting circuits without any issues. Most people were extremely happy with the price. It has been described as a 55ah battery that is sold at a 35ah price point. It is a long lasting battery that is quite durable with a sturdy construction. The battery’s actual physical size is referred to as the battery group. Each manufacturer will construct there batteries to fit into specific group sizes, but some dimensional variations, although slight, will allow room for such things as the post height and the handles. Compare the group size listed on a battery’s label to the amount of space that is available for the battery. A Starting battery such as the ones you find in a car will deliver short, high amp bursts of energy in order to spin a starter. These types of batteries do not survive being deeply discharged. A deep cycle battery will tolerate frequent deep discharges better. They can be discharged and then recharged several times before they become scrap. A dual purpose or hybrid battery will combine qualities from each of the above mentioned batteries. CCA, or cold cranking amps, refers to the number of amps delivered at zero° Fahrenheit for the length of 30 seconds. This determines the battery’s ability to start the engine. MCA, or marine cranking amps, is pretty much the same thing except it is determined at a temperature of 32° Fahrenheit. RC, or reserve capacity, refers to the how many minutes a battery that is fully charged needs to discharge 25 amps at 80° until it goes below 10.5 volts and then dies. Ah, or Ampere-hour, is the rating used for deep cycle batteries. It is usually based on 20 hours of draw from a fully charged battery. The old stand-by in batteries is the flooded-electrolyte. They will deliver a reasonable performance for an affordable price. They do have a high rate of self-discharge, and they will require maintenance such as checking and filling the acid. AGM, or absorbed glass mat batteries, use coils made of fiberglass that are soaked in an electrolyte. This means that they won’t spill acid. They have more power with a smaller footprint, and they have a slower self-discharge rate than electrolyte versions. The date a battery is manufactured will be displayed on the battery label. The year is represented by numbers, and the month is shown with letters. A D2 battery has been manufactured in April of 2012. Look for the freshest battery available before purchasing one. If you are searching for the perfect dual purpose, deep cycle battery, our gold pick is for you. The Optima Batteries Blue Top Marine Battery is both a deep cycle battery and a starter. Next up is our silver pick which is the VMAX AGM Deep Cycle 12v 125ah SLA Rechargeable Battery. The low price point on this particular battery has resulted in it being highly recommended in the online reviews. Those who want the most value for their money will enjoy the Mighty Max Battery 12v 55ah Power Deep Cycle Battery. 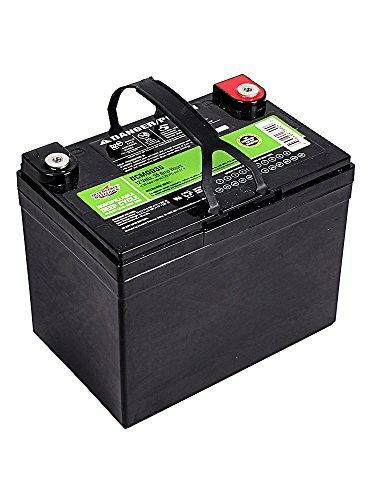 It is often described as a 55ah battery that is sold at a 35ah price point while the Interstate Batteries Sealed Lead Acid Deep Cycle Battery is also a wonderful pick for any budget conscious shopper.